It has been an unpleasant week which began with a break in at my house and ended with my computer deciding not to start up. I should be glad the criminal mastermind who broke into the house didn't decide to take anything of real value, just my peace of mind! I am also lucky that I decided to replace my old computer BEFORE it died so I have a back up. This computer is slow so it will probably take me the better part of the day to finish this entry. Compared to last week, this week has been fairly slow. I did receive a few lessons to review...some before the computer malfunction, some after. Again, I'm glad I have this old computer. I did back up the course materials to it awhile ago. Unfortunately I hadn't backed up all of my student files so I couldn't refer to past letters but at least I could write the letters! Last week I said I would do purlside decreases but I noticed I had not discussed double decreases yet. I'll get to the purl decreases next week. In the Basics class, double decreases are used in two swatches. One mimics the band you would pick up for a V-neck sweater. The other is a simple lace swatch. The first decrease is the Central Double Decrease or S2K1P. Both abbreviations are used but S2K1P describes how to make this decrease. 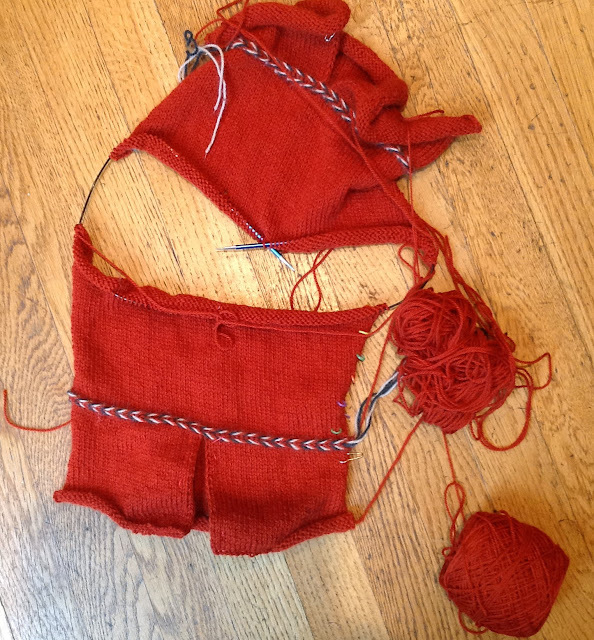 You slip two stitches as if you are going to knit them together, not separately. 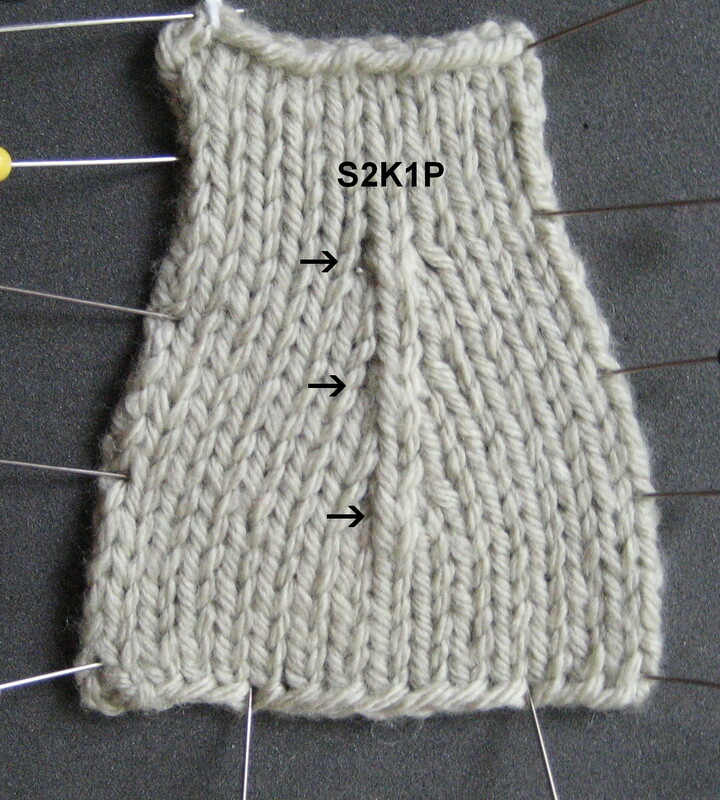 You then knit the next stitch and pass the two slipped stitches over the stitch you just knit. What can go wrong? Since the two stitches are slipped at the same time, they really don't get stretched out so you don't have to worry all that much about their appearance. About the only thing you can do wrong is to slip the two stitches separately. The center stitch does not stay on top if you do. 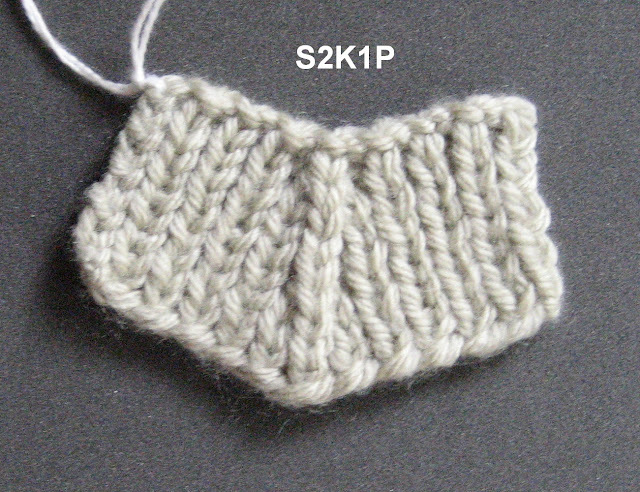 This swatch shows a common use for this decrease. It is ideal for making the decreases in the K1P1 band of a V-neck. It is also used in lace, generally at the top of some triangular shaping with yarnovers on either side. It is also used for the shaping of hat and tam crowns. It is particularly effective in Fair Isle where the center stitch is worked in one color while the surrounding stitches are worked in another. It looks like the spoke of a wheel. When students do this swatch for the Basics class there are two things that seem to go wrong. 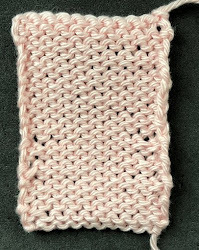 The first is that there are purl bumps in the center stitch. 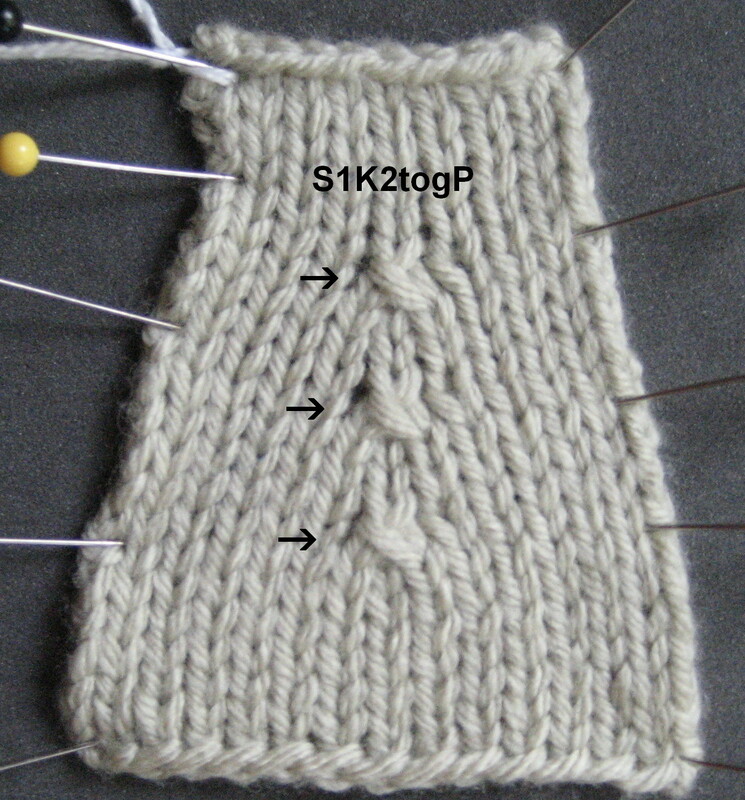 When you use this decrease in ribbing, do not maintain the K1P1 pattern in the center 3 stitches on the WS. Treat them as knit stitches or you will get purl bumps. 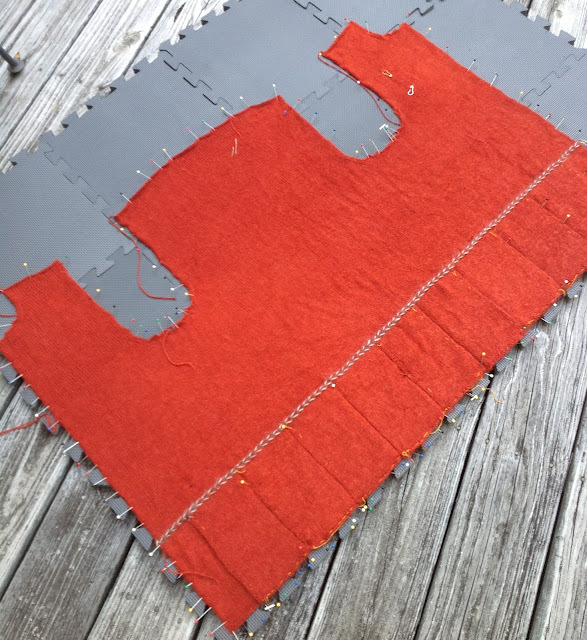 The other thing that sometimes happens is that students forget that they are losing a stitch to the right and left of the center stitch each time they work the decrease. They continue to work the decrease after the same number of stitches as in the first decrease row. The causes the center line to slant towards the left. To work this decrease you work in pattern up to the center three stitches. the stitches to the left and right. You rarely see this decrease anywhere other than lace. What can go wrong with this decrease? Well, since you are slipping the first stitch, you can stretch it out or twist it. The decreases in this example look stretched out to me. Any time you are slipping one stitch you must take care not to stretch it out. If you look at my entry for June 8th under Current Projects, you can see a swatch I did to test out a pattern for some socks where I used both of these decreases. The other double decrease in Lesson 2 is K3tog which you almost never see except in bobbles. It isn't a very attractive decrease. It was nice seeing everyone and catching up on projects. It seemed like I had been gone months and months. I hope the rain doesn't keep everyone away tomorrow! It took over 6 hours to do the pleats and braiding on the cardigan. I made videos of the process for the On-Line Extras in the TKGA website. It wasn't hard, it was just extremely tedious. It was wonderful to go from 656 to 244 stitches. It took no time at all to finish the back and fronts. Here it is blocking. It looks kind of lumpy and bumpy but that all flattened out. I guess 100% humidity is good fro something! 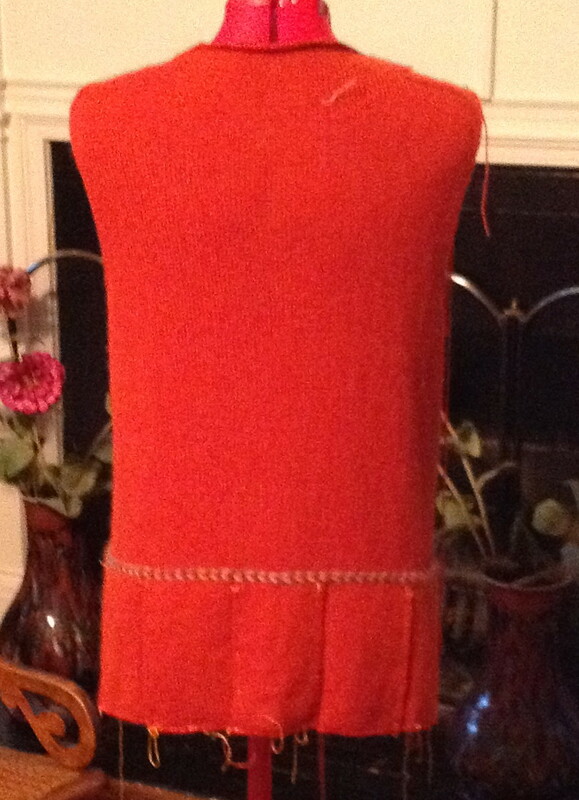 I sewed the pleats in place before blocking them. They took forever to dry. I'm working on the sleeves now. They also have a pleat (inverted box!) at the center. I'm hoping to finish it this week. I am so terribly sorry about your break in & your computer! I hope that next week is awesome!